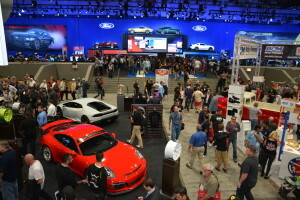 Though a final comparision isn’t truly possible until the April 6 advance-registration deadline, vendor applicant tallies for the 2015 SEMA Show so far are ahead of those for the 2014 event, the show’s director said last week. “Things are looking good,” Specialty Equipment Market Association Show Director Tom Gattuso said Friday. Cautioning that there was always a “crescendo curve” near the advance deadline that could reduce the margin, total exhibitor applications in 2015 were up 30 percent from Jan. 1 to Friday, compared to the same time in 2014. More than 1,500 companies had signed up, far ahead for 2014’s 1,150. “It’s hard to tell how that crescendo’s going to go,” he warned, but he thought that while 2015 advanced registration likely wouldn’t end ahead 30 percent, it probably would be a 15 percent increase from 2014. “We definitely have increased support from the industry,” Gattuso said. For collision repair, 138 companies had already sought display space at SEMA by Friday, compared to less than 90 by March 27, 2014. The tools section — which he said tended to draw the same buyer audience as the collision repair section — was up 40 applications so far to 140. “Collision and tools right now are looking strong,” he said. Combined, they tend to be “one of the sections that’s grown the fastest,” according to Gattuso. Gattuso did notice a “bump” in exhibitors after the Society of Collision Repair Specialists started working with the show in 2010, and he also noted the Repairer Driven Education series and networking offerings they contributed. “It’s really a full package for them,” he said. The show has enlarged its footprint this year and converted some spots to exhibitor space that had been used for another purpose in the past, Gattuso said. “It’s really a new examination of how we’re using the full facility,” he said. SEMA has always vetted applications to make sure exhibitors were relevant to the SEMA Show audience — particularly buyers — but organizers planned to “really hone in” at what should make the cut more than in the past. “It’s not about being big,” he said, more about expanding with the right vendors.